Salem, Ore--Marie Watt (Seneca) is a nationally recognized Portland mixed media artist whose work explores human stories and ritual implicit in everyday objects. 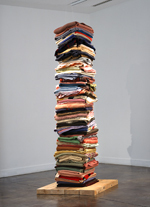 A mid-career retrospective of her work will open Feb. 4 and continue through April 1, 2012, at the Hallie Ford Museum of Art at Willamette University in Salem, Oregon. The title of the exhibition, Lodge, refers to a space of welcome and a place where stories are shared. Born in Seattle, Washington in 1967 and raised in Redmond, Washington, Watt received her BS degree in Speech Communications and Art from Willamette University in 1990. She went on to earn her MFA degree in painting and printmaking from Yale University in 1996 and has enjoyed a highly successful career as an artist, teacher, and storyteller. She has been featured in countless solo and group exhibitions over the past 15 years and is included in numerous public and private collections throughout the United States. For the past decade, Watt has worked as a mixed media artist whose work explores human stories and the ritual implicit in everyday objects. Organized by anthropology professor and faculty curator Rebecca Dobkins, the exhibition will feature a range of work from the past decade, including stacked blanket sculptures, portrait blankets of Jim Thorpe, Ira Hayes, Susan B. Anthony, and Joseph Beuys, and Engine, a felt cave-like structure that honors the act of storytelling and the storytellers in the artist’s life. In addition to the objects on display, the exhibition will be accompanied by text panels, labels, a video component, and a 96-108 page full color monograph written by professor Dobkins that places the artist’s work within the broader context of contemporary art. The book will be distributed by the University of Washington Press, Seattle and London, assuring worldwide distribution and readership. Finally, once the exhibition closes in Salem, it will travel to the Tacoma Art Museum in Washington State for a June 11 to September 24, 2012 venue. Marie Watt: Lodge has been supported in part by a major grant from the Ford Family Foundation in Roseburg, Oregon. Additional financial support has been provided by The Camin Family Foundation; an endowment gift from the Confederated Tribes of Grand Ronde, through their Spirit Mountain Community Fund; the City of Salem’s Transient Occupancy Tax fund; and the Oregon Arts Commission. The Hallie Ford Museum of Art is located at 700 State Street (corner of State and Cottage Streets) in downtown Salem near the campus of Willamette University. Hours are Tuesday through Saturday from 10 a.m. to 5 p.m. and Sunday from 1 to 5 p.m. The galleries are closed Monday. Admission is $3 for adults and $2 for seniors and students. Children under 12 are free, and Tuesday is a free day. For more information, please call 503/370-6855.